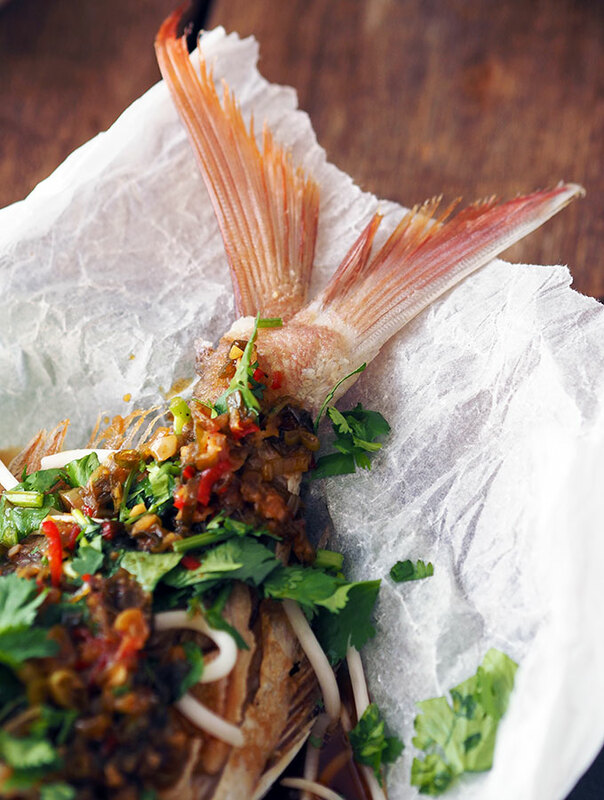 Home » Thai Style Deep Fried Whole Fish, It’s worth the effort! Thai Style Deep Fried Whole Fish, It’s worth the effort! Thai Style Deep Fried Whole Fish is fragrant, juicy and delicious. Simply serve the Thai Style Deep Fried Whole Fish with steamed rice and vegetables. Don’t be hesitant about frying a whole fish. When you make my Thai style deep fried whole fish, all the effort will be worth it. You will see in the recipe below that I haven’t stipulated a fish size. There is a good reason for that. 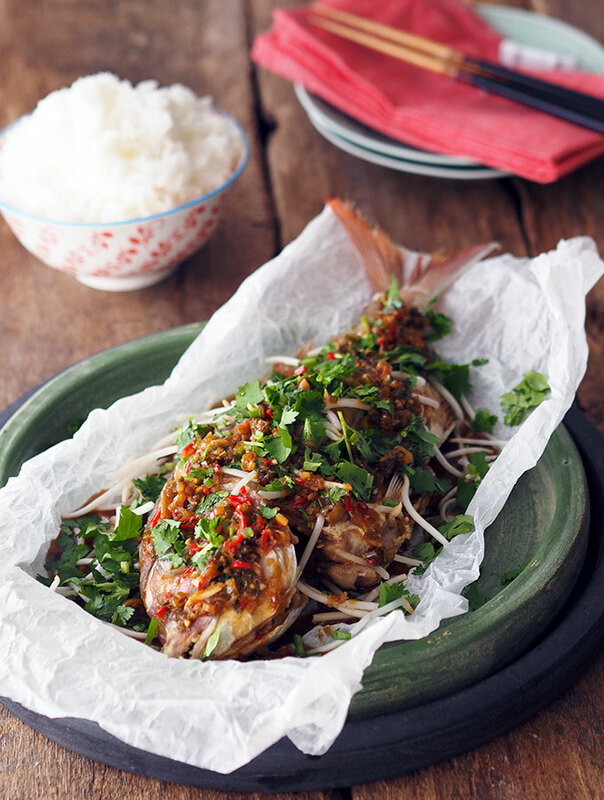 This Thai style deep fried whole fish recipe can be altered to feed the numbers that you need. Plus I also find that the size of fish you purchase is solely dictated by the size of your wok or other deep frying equipment. There is no point in buying a massive fish if you have no way to fry the guy! I find a 600g fish a good size for two people as a meal along with some rice. Or perfect for four with some vegetables or an extra dish and rice. 600g may sound a lot, but don’t forget it is a whole fish. That weight also includes the head, bones and tail. I use snapper for this recipe, it’s a great size to wok fry whole and I love how it has a mild taste. Can’t buy snapper in your neck of the woods, or prefer another white flesh fish? No problems at all, substitute what you like and what’s local. 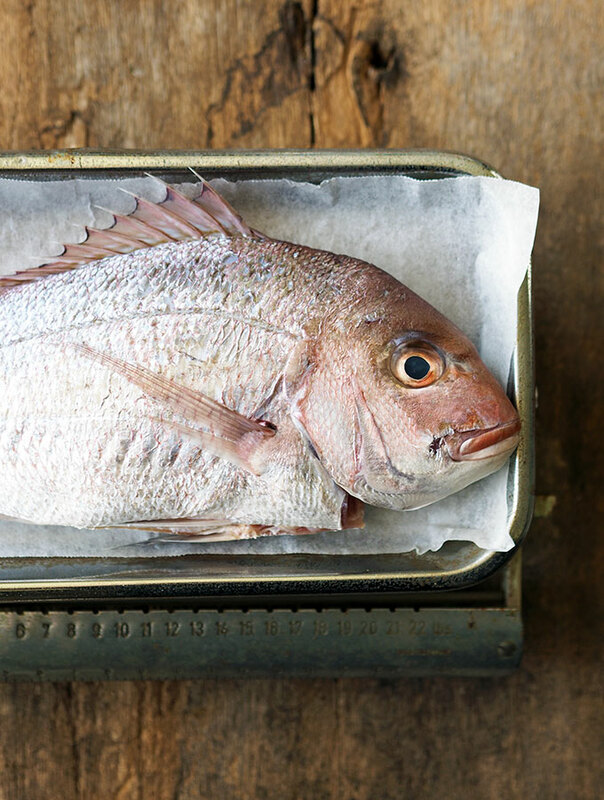 A lot of people are put off frying a whole fish for two main reasons. One the head is still attached and some people have issues with that. The other is the whole frying business in general. There isn’t much I can do if you have a problem with a head still attached to your fish when served. This Thai style deep fried whole fish has lots of garnish, therefore my suggestion is to cover the head with it. As I have done in the photos. I personally love fish head. Though I am not keen on eating the eyes, the cheek meat is so sweet and tender, it’s my favourite part. Like cooking meat on the bone, cooking fish on the bone gives a better result. Both in flavour and also in aiding the fish flesh from drying out. As for frying, wok frying is super easy and not that messy. Use an oil splat guard, turn the range hood on full blast, and you will be saved from an oily kitchen. Also make sure that fish is patted completely dry with paper towel before you add it to the oil. To make my Thai style deep fried whole fish recipe even easier have your fishmonger gut and scale your fish for you. Even if you are comfortable and quite capable of doing it yourself, I find it less messy to get someone else to do the work. Plus I always seem to get a rouge scale turn up in the most unexpected places. You really don’t like whole fish? Or really don’t want to tackle one in your kitchen? It’s okay, we can still be friends. Honestly we can. As we are still friends I suggest using fish fillets. Lightly coat the required number of fillets to feed your tribe with cornflour or potato starch. Then shake off any excess, really shake it off. Fry the fillets in a non stick pan with a little mild tasting oil of your choice. Then top with the sauce and garnish as you would for the whole fish. Thai Style Deep Fried Whole Fish is fragrant, juicy and delicious. Simply serve the Thai Style Deep Fried Whole Fish with steamed rice and a side of vegetables. Rinse your fish to remove any loose scales that may still be clinging to its body. Also take this opportunity to run your fingers over the skin to make sure all scales have been removed. Using kitchen towel pat dry your fish thoroughly. Water left on the fish will cause your oil to spit. With a sharp knife make a couple of deep slits into the flesh of the fish on both sides. Make sure not to cut all the way down to the bone. If you do, don’t panic, the world won’t end. Heat oil in your wok to 180°C (350°F). Make sure that you use enough oil to cover your fish. If you find that bits of your fish stick out, its okay, spoon the hot oil over the fish while its cooks. I always wiggle the head down in the oil for a few minutes to make sure that is cooked through well. Deep fry the fish until it is golden brown and cooked through. Remove fish from the oil and place on kitchen towel to drain while you prepare the sauce. Place 1 tablespoon of your deep frying oil in a medium size saucepan and add garlic, ginger and chilli and green onion. Fry until fragrant. Add shaoxing, soy sauce, fish sauce, palm sugar syrup, rice vinegar and white pepper to the pan. Stir well and bring to the boil. As soon as it reaches boiling point remove immediately from the heat. 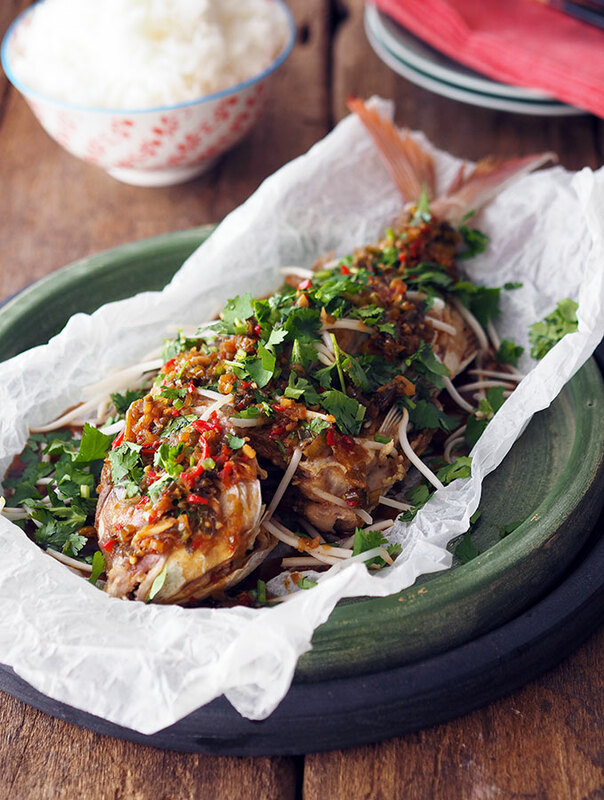 Place fried fish on to a serving platter and scatter with half the coriander and bean sprouts. 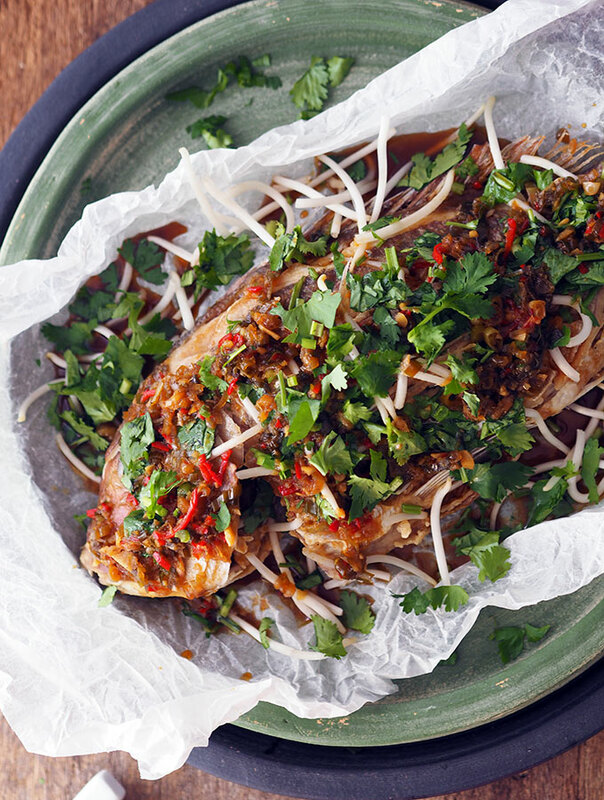 Pour the sauce over the fish and garnish with the remaining coriander and bean sprouts. Note: If you can’t find palm sugar syrup, you can use normal palm sugar. Just made this and it is gorgeous thanks for the receipe i only ever order at restaurants. Sara, good call on this one. We had 16 oz. of small flounder fillets and used them instead of the whole fish, while following the same recipe (we use dry sherry wine instead of the Shaoxing wine, a suitable substitute for sure! )… fed our family of four with a vege Thai red curry side and the fish was a huge, huge hit. Pure genius to put the flavorful robust sauce on top of the fish, and fry the fish in plain oil. We had plenty of sauce left over to mop up with our rice. Wonderful dinner good for our teens and us adults too. Hi Donna, that sounds like an amazing feast. So glad you enjoyed the recipe. I love the idea of using the smaller flounder fillets. BTW I will often use dry sherry as well, it is the perfect substitute. I love preparing fish, but your version of preparing fish is amazing! Can’t wait to taste this! that’s a beautiful, beautiful, beautiful dish! looks gorgeous! i have only tried these in restaurants but absolutely love ’em. Wow, great effort there! Ive always wanted to try this but am daunted by the task – I don’t have a wok big enough and am afraid of the splatter / mess. But I do love eating from an entire fish there really is a difference vs fillets.